Following his death (see previous post), I have been re-reading Alec Jenner's personal memoir (1) of Erwin Stengel, his predecessor as Professor of Psychiatry in Sheffield. Alec also wrote Stengel's Lancet obituary. 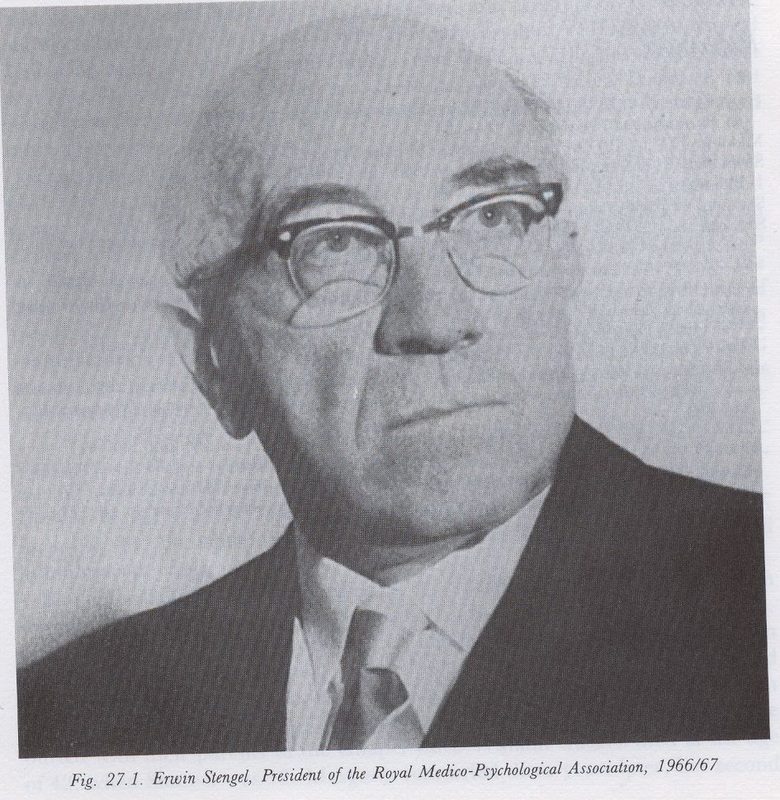 Stengel founded the University Department of Psychiatry in Sheffield in 1957. Alec stepped into his shoes in 1967. Stengel was from Vienna, as was Freud, and I remember Alec showing me an imitation Graeco-Egyptian pot that Freud gave Stengel for treating his maid. As Alec put it, "despite considerable neurological sophistication, there is a struggle to find humanistic explanations" in Stengel's writings. Alec himself had an interest in philosophy even when Director of the MRC Unit for Metabolic Studies. Early in his career, he did nonetheless think he would explain manic-depressive illness biochemically, and probably never gave up the idea that a biological solution to mental illness may be found. Still, after his retirement there were those who sought to undermine his open-minded interest in democratic psychiatry, which they called "anti-psychiatry", and replace his emphasis with neuroscience. The current research interest of Sheffield academic clinical psychiatry is "biological investigation of psychiatric disorders, and includes the use of neuroimaging techniques to investigate psychotic and other psychiatric disorders". Such a narrow modern focus on neuroscience is in contrast to the broader interests of Stengel and Alec Jenner and we at least need to return to a more pluralistic, if not critical, understanding of psychiatry. (1) Jenner FA. (1991) Erwin Stengel. A personal memoir". In: Berrios GE & Freeman H: 150 Years of British Psychiatry 1841–1991. London: Gaskell. pp. 436–44. Professor Alec Jenner, founding editor of Asylum Magazine, died on July 3rd. The funeral service will be held in St Nicholas Church, High Bradfield, Sheffield on Wednesday 16th July at 12:00. Following the funeral service the family would like to invite attendees to join them at the Old Horns, Towngate, Jane St., High Bradfield, Sheffield where refreshments will be served and where good memories of Alec can be shared. I'm particularly sorry to hear of his death. In 1989, he appointed me Lecturer in Psychiatry in Sheffield University, when nowhere else wanted me for senior registrar training. He was professor there for 25 years. He organised regular fortnightly outside speakers in term time on Tuesday evenings, which Tim Kendall and I carried on after he retired, until I left Sheffield in 1996. Alec's contribution to critical psychiatry was immense. He may have preferred to call it democratic psychiatry following Franco Basaglia. More to follow to honour his life and work, but for the moment look at his own view as a psychiatrist from the alternative textbook of psychiatry, which Lin Bigwood and he helped Phil Virden to write. 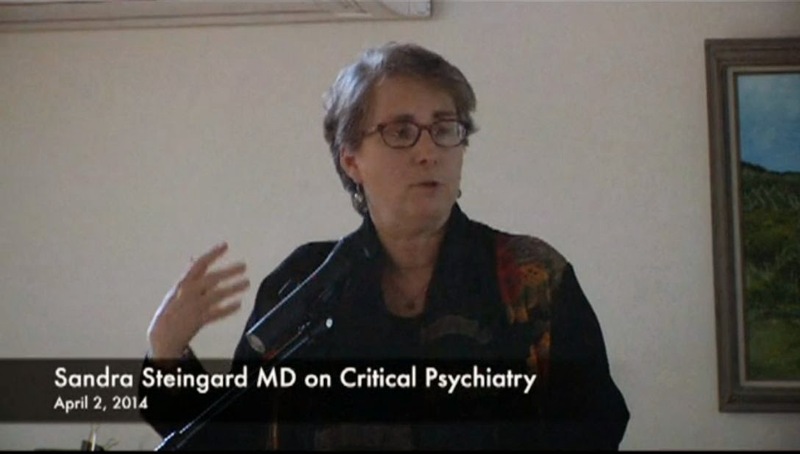 Sandra Steingard has posted a video of a talk "Why I became a critical psychiatrist" on her Anatomy of a Psychiatric Practice blog on Mad in America. She also posted last November the introduction to the forum on the Critical Psychiatry Network (CPN) - North America webpage of the International Critical Psychiatry Network (ICPN) website. Freud was always fairly pessimistic that the move of psychoanalysis to America would preserve his key ideas. It may be said that he was proved right in this expectation. On the other hand, I have always seen critical psychiatry as a broad church (eg. see previous post). So, the American take up of critical psychiatry shouldn't be plagued by similar arguments about doctrinal purity. And I think it would be good if Americans did embrace critical psychiatry as they did psychoanalysis. Thanks to Sandra for her lead.